Oh no! It's a coastal storm! A nor'easter! Batten down the hatches! Head for the hills! New Jersey is about to find itself on the fringe western edge of an admittedly powerful coastal storm system. It will be close enough to bring rain and wind to at least part of the Garden State. But big bad impacts, including any threat of wintry weather, should stay away. For the second morning in a row, Tuesday is starting off downright cold. 20s inland, 30s along the coast, all below normal for early April. At least winds are relatively light, so the cold air won't bite you in the face as you step out the front door. Temperatures will remain on the cool side of normal for Tuesday afternoon, with high temperatures around 50 degrees. At least that's a few degrees warmer than Monday. Skies will be partly to mostly cloudy. 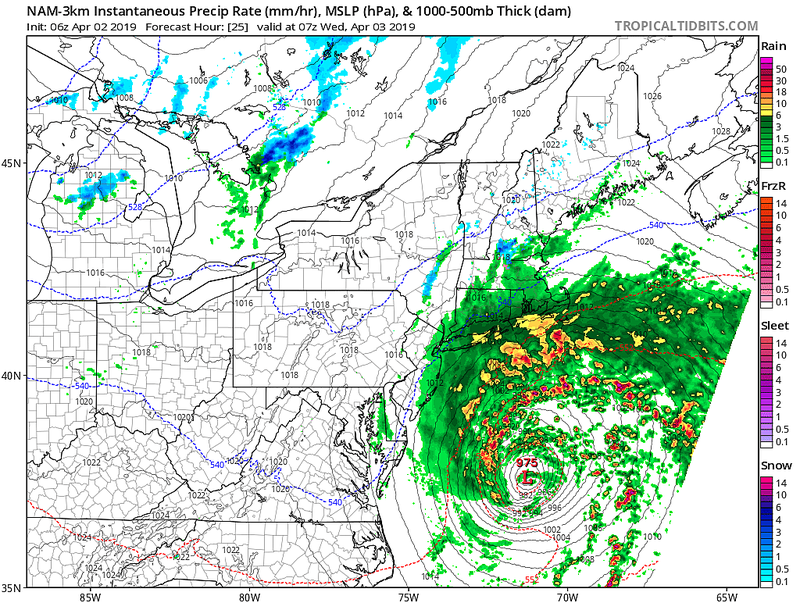 Rain showers may creep into southern New Jersey starting around 4 p.m., spreading through the rest of the state by about 10 p.m. Tuesday evening. There is some question about how far north and west the rain will reach — again, this is a glancing blow, at best. Rainfall totals will likely range from literally zero in NW NJ to about a quarter-inch along the Jersey Shore. Healthy, but not heavy. Winds will be elevated, possibly gusting over 30 mph along the coast. Because of the wind and the strong low pressure churning up the Atlantic Ocean, surf will be rough overnight. Surge guidance is also showing up to a foot of extra water pushing along the Jersey Shore, which could lead to very limited coastal flooding during Wednesday morning's high tide cycle. And that's it! By Wednesday late morning, skies should break into sunshine once again. And we'll warm up nicely, with highs in the lower to (maybe) mid 60s. Winds will still be a bit gusty throughout the day. Thursday's forecast also looks OK. Despite increasing clouds, temps will remain mild near the 60 degree mark. Our next storm system, a slow-moving frontal complex, will drive more rain into New Jersey Thursday night. I still think Friday looks like a generally wet day, although not quite a washout. (I like the GFS model depiction of two distinct rounds of rain — light stuff in the morning, heavier late Friday.) It's going to be an uncomfortably cool and damp day, with thermometers struggling to pass the 50 degree mark. By Saturday morning, showers come to an end and the first half of the weekend looks stellar. With partial clearing (at least), high temps on Saturday are forecast to make a run for 70 degrees (away from the coast). Nice! Sunday will be almost equally mild. But the long-range forecast shows wet weather returning late Sunday into Monday — with potentially soggy, unsettled weather throughout much of next week.